MONDAY AFTERNOON UPDATE: Big news from CANADA - Toronto's CKFM (99.9) ended its stunting at 4 PM by flipping to "Virgin Radio," as Astral Media inaugurated a licensing agreement with Virgin that puts the international brand and a top-40 format on the former "Mix 99.9," with Mad Dog and Billie remaining in mornings and the inescapable Ryan Seacrest later on in the day. Much more on this change next week. *This column almost came to you with a MAINE dateline this week, as we contemplated spending a few days before the Labor Day weekend visiting friends and colleagues in the Pine Tree State. We stayed home instead (though we're heading to Pittsburgh in a few days for the National Radio Club convention, hence this double issue - we'll be back Sept. 8 unless there's major breaking news in the meantime), but if we'd made the drive, we'd have been there just ahead of some big format shuffles. Last week, NERW broke the story of a major rearrangement of Atlantic Coast Radio's Portland-market signals, and this week we can fill in all the blanks - and tell you about some changes down the road at the Nassau stations, too, not to mention a big change up in Bangor. First, Atlantic Coast: As we reported last week, it's the end of the line for "Red Hot 95.9." That station - WRED (95.9 Saco) - will become half of a new Atlantic Coast sports station in the market, as owner J.J. Jeffrey affiliates with Boston's WEEI and puts its sports programming on 95.9 and on WJJB-FM (95.5 Topsham), which had been half of the locally-programmed "Big Jab" sports signal. The Big Jab will stay in the market on a stronger signal, replacing talk on what's now WLOB-FM (96.3 Gray) and remaining on WJJB (1440 Westbrook). And the talk programming will stay in place, too, but only on WLOB (1310 Portland). Those changes will all take place Sept. 1, and there will be new calls, too - 96.3 will become WJJB-FM, 95.5 will be WTEI and 95.9 will be WPEI. NERW readers with longish memories will by now have noted that the initial announcement of a New England-wide WEEI network last winter included numerous Nassau stations, WLVP/WLAM among them. As WEEI relaunches its regional network plans, Nassau is still absent - but there is now a Bangor affiliate. September 1 will also bring the WEEI network to Blueberry Broadcasting's WABI (910 Bangor) and WWBX (97.1 Bangor), replacing talk on the AM side and top 40 "B97" on the FM. That's a pretty big signal for WEEI, and even if the WEEI network is being handled separately from the Red Sox rights, we have to wonder how much longer Stephen King will be able to hang on to the Sox over at WZON (620). There's a call change at EMF's "Air 1" outlet: WCYI (93.9 Lewiston) becomes WARX. There's a translator swap in southern Maine: W277AM (103.3 Biddeford) is going to Bible Broadcasting Network (which will use it to relay WYFP 91.9 Harpswell), in exchange for two translators in Mississippi and Indiana. And on top of all that radio news, there's TV news from Maine, too: because of "significant equipment problems associated with its analog equipment" (it can't get parts for its aging Comark transmitter, and a deteriorating klystron tube is forcing the station to chug along at 70% of licensed power), Portland CW affiliate WPXT (Channel 51) has been granted FCC permission to shut down its analog transmitter on Sept. 18. Its sister station, My Network TV affiliate WPME (Channel 35), received FCC permission to turn its analog signal off on August 21, allowing the station to complete its DTV antenna work before the Maine winters hit. Both stations are seen by most viewers on cable and satellite, anyway, and WPXT-DT (Channel 43) and WPME-DT (Channel 28) are both on the air. *In NEW HAMPSHIRE, Nassau is complying with the FCC's order to immediately end its JSA with Vox's WWHK (102.3 Concord), leaving Vox without the "Hawk" classic rock simulcast that WWHK has been using for the last few years. For now, we understand that 102.3 continues to carry a rock format, but entirely automated, with only a legal ID playing each hour. What's next for 102.3? NERW readers may recall that WWHK - and erstwhile Lakes Region simulcast partner WWHQ (101.5 Meredith) - were on Nassau's list of stations to join the WEEI network before that deal fell apart last winter. With Nassau now out of the picture, could Vox put 102.3 back into play as a WEEI outlet? In the meantime, WEEI is adding another station in the Granite State. Great Eastern Radio (whose ownership interlocks with Vox) announced last week that it's getting ready to put silent WTSM (93.5 Springfield VT) back on the air from a new city of license - Swanzey, New Hampshire - and with new calls, WEEY-FM, bringing the WEEI network into the Keene market. *The RHODE ISLAND ratings scandal took another interesting turn late last week, as news emerged that the six questionable diaries in the Providence spring Arbitron book were filled out by Kristen DePetro of East Greenwich, wife of WPRO (630)/WEAN (99.7) morning talker John DePetro. Going into the weekend, DePetro and his bosses at Citadel closed ranks, with DePetro saying that he was unaware of the fraudulent diaries, which reportedly listed hundreds of hours of WPRO listening by nonexistent listeners in the prime 25-34 demographic. WPRO management issued a statement saying they were "profoundly disappointed" in Mrs. DePetro. In the meantime, the Providence TV stations, the newspapers and WPRO's competition kept the story very much alive, with Jim Corwin, VP/GM of Clear Channel talker WHJJ (a former DePetro employer) issuing the requisite "We are shocked and disappointed at todays news that fraudulent ratings diaries have come from the home of an on-air personality at WPRO" statement. There's a new permanent midday host at NEW YORK's WPLJ (95.5): Jeff Miles takes the spot formerly occupied by Race Taylor, who's now doing afternoons. Miles comes to New York from Citadel's Dallas operations, where he's been morning show producer at KSCS (96.3 Fort Worth) and host of ABC Radio's "Cruz in the 80s." In the Hudson Valley, unbuilt WJGK (1200 Highland) is being transferred, but it's all within the family: Joergen Klebe's Sunrise Broadcasting sells the construction permit to Hawkeye Communications, controlled by Klebe's wife Irmingard, for $10. The WJGK construction permit was due to expire Sept. 29, but the transfer to Hawkeye should allow for an 18-month extension under new FCC rules that allow small businesses additional time to build newly-acquired CPs. In Albany, a bit of history came down recently: we're told WAMC has finally taken the big "WABY" letters down from the tower of its AM 1400 signal, which once bore those storied calls. Today, that tower on Braintree Street, right next to I-90, carries not only WAMC (1400) but also WUAM (900 Watervliet). Over at Albany Broadcasting, Nik Rivers is out as PD at WZMR (104.9 Altamont); his departure from "The Edge" means morning guy Darwin adds music director duties, Mike the Enforcer shifts from nights to afternoon drive and becomes assistant PD, and Boomer moves from weekends to nights. Upstate, we have this update on the move of Finger Lakes Radio Group's WFLR-FM (95.9 Dundee) to the Ithaca market, as a class A on 95.5 licensed to Odessa: with Dundee translator W245BL (96.9) now on the air and simulcasting WFLR-FM, listeners in the area are being told that "WFLR is moving to 96.9," effective Sept. 1. What will actually play out next weekend, as best we can piece it together, will be WFLR-FM going silent on 95.9 to make its Odessa move - and 96.9 translating WFLR (1570 Dundee), which will flip from its present news-talk format (as part of the Finger Lakes News Network) to the country format now heard on WFLR-FM. And there's good news and bad news from our friends over at WCJW (1140 Warsaw). The good? A power increase to 250 watts on FM translator W279BO (103.7 Warsaw) is giving "CJ Country" greater reach on FM. We heard it clearly Saturday night while watching a Muckdogs baseball game in Batavia, as CJ was carrying a night NASCAR race that it never would have been able to carry in its entirety as a daytime-only AM facility. The bad news actually came from WBTA's Muckdogs broadcast, as the announcer noted the death on Saturday evening of WCJW news director and mid-morning personality Jenny Snow, who collapsed while doing volunteer work for the Perry Fire Department. Morning man Steve Weber will be serving as acting news director, while owner Lloyd Lane will handle mornings until a replacement for Snow can be hired. *As we noted up above, NERW's spending Labor Day weekend in western PENNSYLVANIA at the National Radio Club convention, and we'll have a format change to listen to while we're there. Meanwhile, construction is finally underway on a new tower site for Renda's other AM in the Pittsburgh market, WJAS (1320). NERW readers may recall that WJAS lost its current site near the mouth of the Squirrel Hill tunnel after its landlord sold the property to the city of Pittsburgh, apparently ignoring a "right-of-first-refusal" clause in Renda's lease. Renda ended up going to court, filing a suit that was settled when the city's Urban Renewal Authority sold WJAS a new piece of land north of downtown. While WJAS is building, WPXI (Channel 11) is tearing down. Now that the Cox-owned NBC affiliate is in its new home on the city's North Side, wrecking crews were hard at work last week demolishing most of WPXI's former studio building on Rising Main Avenue, just north of downtown. Only the original 1950s-era core of the building, still home to WPXI's transmitters, will be saved; while WPXI had planned to move its tower to the new studio site, the neighbors objected, and so the transmitters will stay put at the old location. In Harrisburg, Cumulus has flipped WTCY (1400) to ESPN sports, returning the station to its original callsign, WHGB. But it's not the end of the line for the "Touch" urban AC format that WTCY was carrying - it's alive and well on WNNK-HD2 (104.1), and being heard by most of the market via translator W237DE (95.3 Harrisburg). Can a translator carry an FM station's HD2 signal? Cumulus believes it's on solid ground with the FCC here, and we've heard nothing from the Commission to contradict that. Meanwhile at WNNK's main channel, middayer Kelly Iris departs for Grand Rapids and the PD chair at Clear Channel's WOOD-FM (105.7). There's a station sale up along the New York/Pennsylvania border: Cary Simpson's Farm and Home Broadcasting is selling WQRM (106.3 Smethport) to Colonial Broadcasting, which already owns WLYC (1050 Williamsport) and WLMI (103.9 Kane). Pittsburgh's Ray Rosenblum brokered the $290,000 deal - and we'd expect WQRM to change formats, since it's now simulcasting "Sam" adult hits with Simpson's WFRM-FM (96.7 Coudersport). Over near the Ohio/Pennsylvania border, WKQW (1120 Oil City) has flipped from "Wildcatter Country" to oldies, as "11Q." In Philadelphia, WPEN (950) will be without afternoon host Jody Macdonald for a while. "Jody Mac" is having heart surgery today, and we join the rest of the radio community in hoping for a quick and full recovery. Michael Bradley is filling in for Macdonald while he's recuperating. And there's an analog TV signal leaving the air early in that area, too: WTVE (Channel 51) in Reading tells the FCC that the $40,000 klystron tube in its transmitter is "expected to fail completely in the near future," so it's asking the FCC for expedited permission to go silent on September 30, "or at the earliest possible date." WTVE-DT (Channel 25) is experimenting with "distributed transmission," using eight DTV transmitters scattered from Maryland to New Jersey to extend the reach of its digital signal. *In MASSACHUSETTS, DJ Pup Dawg is the new music director at WJMN (94.5), filling the gap left by Gee Spin's departure for the APD/MD post at sister station WWPR in New York. Pup Dawg has been part of Jam'n's morning show for the last few years. Meanwhile, sister station WXKS-FM (107.9 Medford) will be looking for a new night jock as Jackson Blue departs "Kiss 108" for afternoons at Clear Channel's "Kiss" in Dallas (KHKS 106.1 Denton). *In VERMONT, there's a new morning show to replace the long-running "Corm and the Coach" at "Champ" WCPV (101.3 Essex NY)/WCVR (102.1 Randolph). "Rich and Mary's Morning Mess" pairs Mary Cenci, who'd been doing afternoons at the station, with Rich Haskell, who returns to the station he programmed from 1997-2000. Steve Cormier retains his operations manager title as he moves to middays, and former morning show producer Carolyn moves to afternoons to replace Cenci. In Rutland, veteran sportscaster Jack Healey has left WSYB (1380), ending a career there that began in 1971. (He left in 1975 for now-defunct competitor WHWB, but returned in 1982.) Healey is heading for the world of webcasting, joining the crew at NortheastSports.net to do play-by-play for Castleton State University. Healey is also leaving his play-by-play gig as the voice of UVM hockey, a job that helped him win the "Vermont Sportscaster of the Year" award 18 times and landed him in the Vermont Broadcasting Hall of Fame. *The AM-to-FM drumbeat continues up in CANADA, where the latest batch of CRTC applications finds CJOY (1460 Guelph ON), CIGM (790 Sudbury ON) and CFDR (780 Dartmouth/Halifax NS) all applying for FM moves. Corus' CJOY application - for 95.7, with 30 kW DA/176' - is part of a package of more than a dozen applications to be considered by the CRTC at a hearing October 20 in Cambridge, Ontario. There are also three applications for new signals on 101.5 in Guelph - Blackburn Radio wants a classic rock/new rock station, Durham Radio proposes a "new distinctive rock" format and Frank Torres wants an all-blues station. Down the road in London, the CRTC will consider nine applications for new stations: on 98.1, Torres wants a blues station; Evanov proposes a "youth contemporary" format; Rogers proposes a hit radio station with "an on-demand, on air and on-line local radio experience;" CTV proposes a "modern hit" format; Durham Radio proposes a "pop/oldies" format and Blackburn proposes a AA format. Blackburn also submitted an alternate proposal to use 91.1, where United Christian Broadcasters proposes a religious station. Sound of Faith Broadcasting proposes a religious signal on 99.9, and in nearby St. Thomas, My Broadcasting proposes a "gold-based AC" format on 94.1. Up in Sudbury, CIGM's move to FM - made possible by the swap that sends CIGM to Newcap and CFDR in Nova Scotia to Rogers - would find the 50,000-watt AM 790 facility moving to 93.5, with 100 kW/667'. At CFDR, which had previously been granted a move to 88.9 with 21 kW, the new application from Rogers would instead move the 50,000-watt AM 780 signal to 92.9, with 100 kW/643' DA. In Saguenay (zone La Baie), Quebec, Carl Gilbert has found a frequency for his new FM station; it will operate on 105.5 with 6 kW DA. In Nova Scotia, Wayne Harrett's "Seaside FM" (CFEP Eastern Passage) has been granted a frequency change that will, at long last, allow the station to boost power from 50 watts to 1.3 kW to better cover Metro Halifax. CFEP initially planned to upgrade on its current frequency, 94.7, but after interference complaints from CKWM (94.9 Kentville), it settled on 105.9 instead. In northern New Brunswick, the CBC has applied to move Radio One transmitter CBZW Woodstock from 91.9 to 95.3, getting it out of the way of Radio-Canada's soon-to-debut CBAF-FM-21 (91.7 Bon Accord). In Toronto, former CHUM-FM morning co-host Rick Hodge, until recently one-third of "Roger, Rick and Marilyn," has moved across town (OK, a couple of blocks up Yonge Street) to CFRB (1010), where he'll join Bill Carroll in mornings and host a Sunday-night comedy show. As for CHUM itself, word is that when the sale of its venerable 1331 Yonge St. headquarters is complete, the stations - and their famed neon sign - will move downtown to 250 Richmond St. W., just around the corner from the soon-to-be-former CITYtv building at 299 Queen St. W.
CTVglobemedia has finished rebranding the "A Channel" stations it took over as part of its purchase of CHUM Ltd. The stations in Ottawa (CHRO), Barrie (CKVR), London (CFPL-TV), Wingham (CKNX-TV), Windsor (CHWI) and Victoria, BC (CIVI) have all been reborn as simply "A," with a new website at Atv.ca, and they now have a sister station in the Maritimes, as the former Atlantic Satellite Network, sister to CTV's ATV stations in Halifax, Sydney, Saint John and Moncton, has been reborn under the "A" banner as well. The station is expected to sign off as WAVX on Wednesday, when VPR closes on its purchase of the station from Christian Ministries, Inc. It will return Friday at - when else? - 9:09 in the morning. When it does, it will help to fill out the VPR Classical network that signed on in 2004 at WNCH (88.1 Norwich), serving the Connecticut River Valley. The network grew in a small way with translators, then added a second full-power signal, WJAN (95.1 Sunderland, now WVTQ), earlier this year - but until now, it's been heard in Burlington and vicinity only via web streaming and the HD2 channel of VPR's main network. In Albany, Regent has not only returned to sports on WEEV (1300 Rensselaer) after the demise of the GreenStone Media talk network - it's also returned to the station's former calls of WTMM. Will the format change (which creates a simulcast with WTMM-FM 104.5 Mechanicville) be permanent? Two new calls on two new religious outlets in PENNSYLVANIA: WMBZ (88.5 Halifax) changes to WLVU, as it joins EMF Broadcasting's "K-Love" network. Meanwhile, Family Life Network has acquired the former WDAH (91.5 Shenandoah PA), which becomes WCIM. The next newest station in Canada will likely be My FM's new outlet in Nappanee. CKYM (88.7) is close to completing its testing, and when it signs on, Milkman UnLimited reports Rob Calabrese will be doing mornings, with Matt McIntyre in middays and Jamie Cybulski in afternoons. It's not often that a brand new radio group bursts on the scene - and even less often that such a group does so by buying nearly a dozen stations in two states at once. But that's what Lloyd Roach, owner of WCOJ (1420) in Coatesville, PENNSYLVANIA did last week, creating a new group that will be a major presence in one market, a minor presence in another and with the potential to add significantly to its holdings in the months to come. Roach's new "Route 81 Radio" launches with WCOJ and clusters in two markets. In the Scranton/Wilkes-Barre area, the group is buying WKJN (1440 Carbondale), WCWI (94.3 Carbondale) and WAZL (1490 Hazleton) from Citadel and WNAK (730 Nanticoke) from Seven Thirty Broadcasters. WKJN, WCWI and WAZL have long been somewhat forgotten corners of Citadel's big Northeast Pennsylvania cluster. WCWI does "Cat Country,"simulcasting out-of-market WCTO 96.1 Easton PA; it's simulcast with WEMR 1460 Tunkhannock, which presumably needs a new format now. WKJN and WAZL have been simulcasting the news-talk of WARM 590 Scranton, which was itself rumored to have been for sale. WNAK is probably the best known of the four, running a standards format that has long shown up well in the ratings up and down the valley. The deal also includes WHYL (960 Carlisle), which has been doing oldies for Citadel on the fringe of its Harrisburg cluster. Route 81 will make its biggest splash, though, in a market that's not even near Route 81. The new company is buying the Eolin Broadcasting "Radio Works" cluster that includes talkers WENY (1230 Elmira) and WCLI (1450 Corning), AC "Crystal" simulcast WENY-FM (92.7 Elmira) and WCBA-FM (98.7 Corning), oldies WGMM (97.7 Big Flats) and oldies WCBA (1350 Corning). A station sale in southern NEW JERSEY: it's been a given that the stations left behind when Howard Green died last year would be sold, and now we can tell you who's buying them. For $22 million, Access.1 Communications (the old Unity Broadcasting) gets NBC affiliate WMGM-TV (Channel 40) in Wildwood, classic rock WMGM (103.7 Atlantic City), oldies WTKU (98.3 Ocean City), sports simulcast WOND (1400 Pleasantville) and WGYM (1580 Hammonton), and R&B oldies WUSS (1490 Pleasantville). About half the sales price will end up with the Salvation Army, chief beneficiary of Green's estate. Up in VERMONT, Radio Free Brattleboro isn't staying silent - and they want to make sure everyone knows about it. Forced off the air earlier this summer by FCC inspectors, the community station put out the word last week that it would sign back on Friday afternoon at 5 on a new frequency, 107.9, and that's just what they did, with a burst of media attention that landed them in every trade publication and even the Boston Globe. The RFB folks are making the case that, having been shut down for lack of "authority to broadcast," they've now obtained that authority - not through FCC channels but through a petition that they say has been signed by 2,000 people (in a town of barely twice that population) and through support from the local government and even the local paper. They also say - apparently with a straight face - that they have no idea whether or not the FCC will notice that they're back on, or care. Over the last few years, Clear Channel Radio has built a reputation as a non-stop purchaser of stations - but America's biggest radio company sometimes sells stations, too, and that's just what it did last week in western PENNSYLVANIA. In the Johnstown market, Clear Channel owned just two stations: country WMTZ (96.5) and news-talk WNTJ (1490), which wasn't a tiny position (WMTZ is regularly the #1 station in the market), but was also far from the big clusters the company likes to build. Over in Grove City, on the eastern fringes of the Youngstown market, Clear Channel had the opposite problem - a cluster that was too big to fit within the FCC's new guidelines for station ownership. For almost four years now, Clear Channel has been trying to buy country WICT (95.1 Grove City), standards WNIO (1390 Niles OH), top 40 "Kiss" WAKZ (95.9 Sharpsville) and oldies WBBG (106.1 Niles OH) from Gocom, which also owns Youngstown's WKBN-TV (Channel 27) and the Fox LPTVs there - but the deal's been held up because of market-concentration problems. Labor Day weekend brought new calls and a new format to WEMG (104.9) in Egg Harbor City, NEW JERSEY: after a four-month stunt as country and a day of nonstop heartbeats, it relaunched Friday as WOJZ, "Smooth Jazz 104.9." Karlson and McKenzie, the morning team that got its start at the old WEGQ (93.7) in Boston and then spent several years at WZNE (94.1) in Rochester, landed a new gig: it turns out the weekend stunting on WPDH (101.5 Poughkeepsie) was a leadup to K&McK's arrival in the Hudson Valley, where they replace Coop & Mikey, recently dismissed by Cumulus there. In what has to be the biggest one-day set of radio transactions ever, Capstar is merging with Chancellor, while CBS is spinning off its radio operations under the old Infinity Broadcasting name. We'll start with the Capstar-Chancellor deal, which has been rumored ever since Hicks, Muse began building two of the nation's biggest broadcast groups. Chancellor was the big-market operator, with Boston's WJMN and WXKS-AM/FM and New York's WHTZ, WKTU, WAXQ, WBIX, and WLTW - along with WALK AM/FM on Long Island. Capstar was the smaller-market broadcaster, with WZNN, WTMN, WMYF, WXHT, WSRI, WHEB and WERZ on the New Hampshire seacoast; WGIR AM-FM in Manchester; WEAV, WEZF, WXPS, and WCPV in Burlington-Plattsburgh; WTAG and WSRS in Worcester; WHJJ, WSNE, and WHJY in Providence; WHMP AM-FM in Northampton; WPKX serving Springfield; WPOP, WWYZ, WKSS, WMRQ, and WHCN in Hartford; WPLR (and an LMA on WYBC) in New Haven; and WTRY AM-FM, WGNA AM-FM, WXLE and WPYX in Albany. The $4.1 billion deal makes the combined Capstar/Chancellor the largest radio operator in America, with 463 stations in more than a hundred markets -- not even counting Hicks, Muse's substantial TV holdings. Meantime, more than two years after CBS bought Infinity Broadcasting, the Infinity name is coming back. CBS is spinning off its radio assets, along with some billboards, into a new company bearing the Infinity name. Mel Karmazin stays in charge of the new Infinity, along with his post as President of CBS Corp., which will continue to own 80% of the new radio company. In our region, that puts the Infinity name on Boston's WBZ, WNFT (still being held in a trust), WBMX, WZLX, WODS, and WBCN; Hartford's WTIC AM-FM, WZMX, WRCH; New York's WFAN, WCBS, WINS, WXRK, WCBS-FM, and WNEW; Rochester's WZNE, WCMF, WPXY, and WRMM; and Buffalo's WECK, WLCE, WBLK, WJYE, and WYRK. It's a far cry from the original Infinity -- WZLX, WBCN, WFAN, and WXRK, plus the since-sold WBOS and WOAZ in Boston and WZRC New York. Northern VERMONT won't be able to listen to Howard Stern out of Canada any more; Montreal's CHOM (97.7) has dropped him despite respectable ratings. CHOM's owner, the CHUM Group, was under heavy pressure from the CRTC to take Stern off the air, especially after planning to add Stern's TV show to its CITY-TV (Channel 57) in Toronto. Stern's lone Canadian outlet now is CILQ (107.1; "Q107") in Toronto, and NERW wonders if it too will dump Stern to curry the CRTC's favo(u)r, since Q107 owner WIC is trying to sell its radio properties to Shaw. In any event, Stern can still be heard on WIZN (106.7) in Vergennes. Imagine MASSACHUSETTS without Joe Martelle -- or Joe Martelle outside Massachusetts. After 17 years, it's about to happen. The veteran of two incarnations of WROR has taken a job doing mornings at Houston oldies outlet KLDE (94.5). Howard Stern is adding another Bay State outlet, Cape Cod's WPXC (102.9 Hyannis). 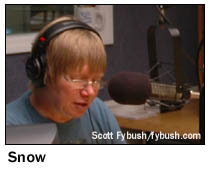 So what about R.J. Makkay, recently hired to be "Pixy 103"'s morning guy? He's going to sister station WCIB (101.9 Falmouth) instead, replacing Doug Frye and Mina Greene. He'll also serve as PD for WCIB. We'll start our NEW YORK news with a rare TV call change: Watertown PBS affiliate WNPE-TV (Channel 16) is changing its identity. The station is paying $5,000 to WPBS (1050) in Conyers, Georgia for the right to become WPBS-TV, calls the station began using on September 1. WNPE's other transmitter, on Channel 18 in Norwood, remains WNPI, with a one-line ID at the bottom of the screen identifying it as such. Two other call changes: AM 1190 in Cobleskill moves from WLAL to WXBH, and William H. Walker's new 102.1 in Jeffersonville is assigned WWHW.